I think it’s a great article, and an important one, but I think it’s simultaneously important that we remain aware of the capacity in which photography can harm our, as well as our audience’s relationship with the natural world. We’ve got to be careful not to commodify that which we photograph, not to turn subject into object. Objectification reduces subject to object, physical individual to abstract, and in doing so reduces ourselves. We are our relationships. I think it’s possible to maintain a healthy relationship with our subject, be it mountain or moose, though we don’t always do this. I can’t tell you how many times I’ve witnessed wildlife photographers behaving as little more than badly-dressed paparazzi, hounding and harrowing their prey as if they’re Britney. If that’s conservation, I don’t care for it. Writer John Zerzan says that all symbolic representation is ultimately alienating, that it disconnects the viewer with the physical world. Whilst I think that’s true, in many cases, I don’t think it’s intrinsically alienating. I think that kind of alienation can happen in many ways, symbolic representation or not. I also think we can engage art, representations and expressions of experience, and connect in new, deeper ways rather than disconnect. We need to remain conscious, awake, and connected to the world around us. Like the article says, nature photography has the potential to do that in ways we desperately need, but the possibility exists that it can also separate us from that we hope to protect. Powerful stuff. Images tell stories. The question then is what story do we seek to tell, and how do we tell it. Bob Dylan and Madonna are both songwriters, but consider the stories they choose to tell – ‘With God on our Side’ examines a reality that’s starkly different to, say, ‘Holiday’. Certainly both serve a purpose, just as American Idol and Hotel Rwanda Hotel both serve a purpose – entertainment for entertainment’s sake is something we need to be careful of, because it so easily becomes our reality. I think representing the world around us with honest, passionate, and concerned photography is very different to exploiting it with simply ‘more’ imagery. Again, I’d reiterate we need to be careful when we consider this. Like I wrote a few days earlier, we’re not ‘protecting nature’ – we’re effectively serving ourselves. Putting ourselves in this role of Game Park Manager is a dangerous one, and not a step likely to lead us out of the mess we’ve raced into. I think the mission is more critically learning to value the world we live within, and see that we don’t exist separately from it. If we do that, we won’t have a need to ‘protect nature’, that part of the equation will take care of itself. 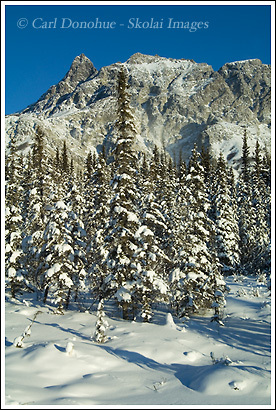 This entry was posted in Alaska, Environmental Issues, Landscapes, Rants, Winter, Wrangell - St. Elias National Park on March 28, 2008 by Carl D.
I read both articles , and they have many valid points. God rest his soul, but I wish Timothy Treadwell, Charlie Russell, & amateurs like them would or could have taken that approach & not crowded the wildlife. We are definately part of nature & need to respect it. Oh, if it were just those 2, I wouldn’t worry too much about it – and those guys were/are so out of the public eye I don’t think it’s a big deal – now you go Yellowstone in mid-September, and you’ll see what I’m talking about. I was at a wildlife photographer’s gallery opening a couple weeks ago. This photographer is part of a local camera club as well, so of course there were many camera club members at the show. In this gallery there is also a master’s section, displaying the works of well-knows such as John Shaw, Larry Ward, etc. This gallery also had a local photographer’s work on display, who had documented really well the Karner Blue Butterfly and it’s local habitat, which is an endangered species. What disturbed me at this particular event was that people were commenting negatively on the prints here against the typical setup shots they see in camera club competitions – pure out-of-focus backgrounds with delicately crafted perches. The prints on display had good representations of environment, food sources, etc – done quite well actually. I quickly pointed out that it is a documentary display of a local endangered species, its habitat, food sources, etc. To the point of the article, I think it is also going to take some shifts in the mentality of what some photographers consider good images – that it is OK to show environment if a story is being communicated! The article communicates a great message. I did go back & listen to Bob Dylan’s ” With God On Our Side”. Powerful lyrics and unfortunately quite true. Really makes you reflect on what we are ” supposed to do” rather than what we want & should do as part of this world. Carl, you have very thought-inspiring articles, which maybe sometimes we don’t look at things exactly the same. But I like that because I think basically we’re all on the same page here. yes, that’s a big issue – we look at what we want to see. The problem, of course, is if we reduce what we see to something so isolated, how can we understand a larger picture, such as the landbase, or ecosystem? How do you generate those shifts you mentioned? Beth, the Neville Brothers did a GREAT version of that Bob Dylan track on their “Yellow Moon” album .. you should hear it sometime if you haven’t already – it’s amazing. Glad you appreciate the notes here. Hy Carl- I will look for that Neville Brothers CD or album. I wanted to comment that I think people who seek out wildlife or wilderness photography already have the big picture of wanting to keep wilderness the way it is. When I look at one picture, I automatically think of all wild places and hope to keep them that way. There sure are too many people used to the easy things in life. I think that’s why most people don’t care. They are too caught up in the rat race.Luckily, there are a lot of people who do care. Just as an afterthought, I hate the vacation sport of bear-viewing!!! Hike in the woods like normal people! That’s a really great album by the Neville Brothers. Definitely check it out – Daniel Lanois produced it, he’s worked on a lot of stuff, like U2, Dylan, Emmylou Harris, etc . really cool album. I think if you ever go to a place like Katmai and get to see the bears up close, you might not hate it so bad. It’s an incredible experience. Not like running into one on the trail in the backcountry, but really, really cool.